Polycystic ovary syndrome puts older women at increased risk of cardiovascular disease and type 2 diabetes following menopause. Helping clients and patients make lasting dietary and lifestyle changes can improve their health and lower their risk of chronic disease. Once referred to as the “medical black hole,”1 the transition from the childbearing years to menopause largely has been ignored in women with polycystic ovary syndrome (PCOS), a common endocrine disorder. The majority of studies on PCOS have examined the reproductive and metabolic disturbances of women of reproductive age, yet PCOS is a chronic condition the medical community realizes must be managed throughout a woman’s life. This article reviews the research that’s been presented thus far regarding aging women with PCOS as well as the associated changes in hormones, body composition, and metabolic parameters that occur. Strategies to implement medical nutrition therapy (MNT) and improve nutrition counseling also are discussed. PCOS is a hormonal imbalance characterized by high levels of androgens (ie, male hormones such as testosterone) from the ovaries and is associated with insulin resistance. Small cysts called poly cysts usually, but not always, surround the ovaries and appear as a strand of pearls on an ultrasound examination. The cysts result from but don’t cause hormonal imbalances. The overproduction of androgens in women causes excessive hair growth on their face and body (hirsutism), alopecia, acne, skin problems, and irregular or absent periods. The majority of women with PCOS who are insulin resistant will experience weight gain in the abdominal area, difficulty losing weight, intense cravings for carbohydrates, and hypoglycemic episodes. Now that more is known about the syndrome and the influence of insulin on the increased risk of type 2 diabetes and cardiovascular disease (CVD), changes in PCOS beyond the reproductive years is getting more attention. For example, panelists from the 2012 National Institutes of Health Evidence-Based Methodology Workshop on PCOS proposed changing the syndrome’s name to one that doesn’t just focus on the ovaries but represents the long-term health implications associated with the syndrome. Moreover, longitudinal studies have been conducted with postmenopausal women who were first studied 20 to 30 years ago to examine changes in PCOS presentation associated with age. Several studies have attempted to answer questions about PCOS and aging, such as whether the syndrome gets worse or improves after menopause and whether it can be cured or it simply disappears. Fortunately, these studies have successfully answered these questions. As women age and transition through menopause, estrogen levels naturally decrease. But what effect does aging and declining estrogen have on reproductive hormones for women with PCOS? Constant long-term exposure to elevated androgen levels in women with PCOS can have a lasting effect on excessive facial and body hair, hair loss, and even balding that extends past menopause. Although older women with PCOS reported fewer hot flashes and episodes of sweating compared with women without PCOS, they also reported significantly more hirsutism (64% vs. 9%).7 These dermatological effects can be detrimental to a woman’s self-esteem and body image. Knowledge of the hormonal changes and their impact on symptoms and self-image can help dietitians empathize with and more effectively counsel older clients and patients with PCOS. Several studies have shown that as women with PCOS age, their risk of CVD and type 2 diabetes rises, stressing the need for early detection and aggressive treatment of the syndrome. Early detection and treatment of impaired glucose tolerance with lifestyle changes and insulin-sensitizing medications (eg, metformin) are crucial to prevent further health complications in the PCOS population. Clearly, women with PCOS face lifelong health risks extending beyond the reproductive years. 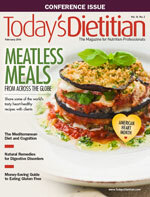 According to a study by Talbott and colleagues, “The implication is that the menopausal transition coupled with a lifelong increase in cardiovascular risk factors (obesity, hyperinsulinemia, increased LDL and decreased HDLT) continues to create an adverse environment and a process in women with PCOS that outpaces those of non-PCOS women.”16 Dietitians can provide nutrition counseling and education to older women with the syndrome to help them make positive changes in their eating habits and subsequently reduce their disease risk and improve their health. Weight loss of 5% to 10% of total body weight has been shown to improve both reproductive and metabolic parameters associated with PCOS.17 In fact, a range of potential dietary approaches have had favorable effects on weight loss and metabolic parameters in PCOS. One approach involves modifying the glycemic index (GI) and glycemic load (GL) to minimize the rise in insulin and glucose from food. Blueberries and apples, for example, are low-GI fruits that don’t raise insulin and glucose levels to the degree that high-GI bananas or pineapples do. Other nutrition strategies for PCOS involve modifying carbohydrate, fat, and protein intake or using meal replacements (eg, nutrition bars and drinks). A study in The American Journal of Clinical Nutrition showed a high-protein diet (greater than 40% of calories from protein) without caloric restriction resulted in greater weight loss (7.7 kg vs. 3.3 kg, or roughly 17 lbs vs. 7 lbs) and body fat loss despite the lack of caloric reduction.19 In addition, those following a high-protein diet saw greater reductions in waist circumference and decreases in glucose than those following the standard protein diet. The researchers suggested that the high-protein diet group lost more weight because of the satisfying effects of protein on appetite—that is, the women may have felt more satisfied and less hungry when eating a high-protein diet so they consumed less food overall. Since older women with PCOS have been shown to have high CRP levels, they may benefit from a diet that emphasizes anti-inflammatory foods, including fiber-rich foods (eg, whole grains, fruits, vegetables), red wine, and omega-3 fats (eg, fatty fish, walnuts, egg yolks). But studies examining the optimal diet composition specifically for older women with the syndrome are needed. There’s no conclusive evidence that one dietary strategy is superior to another in achieving long-term weight loss and metabolic improvement, but what’s clear is that older women with PCOS require MNT interventions to prevent or improve metabolic abnormalities and reduce the risk of chronic diseases such as CVD and type 2 diabetes. Supplementation with magnesium was shown to improve glucose and insulin sensitivity in overweight individuals without diabetes.23 The antioxidant and amino acid n-acetylcysteine (1.8 g daily) was shown to improve insulin sensitivity and lipid profile equally as well as metformin in women with PCOS.24 Cinnamon (1 to 6 g daily)25 and alpha-lipoic acid (1,200 mg daily)26 also have been found to have insulin-sensitizing properties. Clients and patients can purchase these supplements over the counter. Omega-3 fatty acids offer numerous health benefits to women with PCOS. They can reduce inflammation, lower triglycerides, enhance mood, and improve hirsutism and insulin resistance. In a study published in the Journal of Obstetrics and Gynaecology, overweight women with PCOS were given 1,500 mg of omega-3 fatty acids daily for six months. BMI, insulin, and testosterone levels decreased significantly during treatment.27 Optimal amounts of omega-3 fatty acid supplementation range from 1 to 4 g daily. While MNT and various supplements may improve the health and well-being of older women with PCOS, dietitians may encounter unique challenges when counseling them. Aging women with PCOS who have struggled with their weight for most of their lives may be chronic dieters, having followed numerous different regimens in the past. As a result, they may distrust their ability to self-regulate food intake and engage in distorted eating practices, such as restricting, binging, purging, using diet pills and laxatives, or excessively exercising, potentially adding to the pathogenesis of PCOS. These women also may hold negative and false food beliefs that need to be addressed in nutrition counseling sessions. It’s imperative that dietitians screen patients with PCOS for eating disorders before recommending changes in eating behavior. It’s now evident that PCOS doesn’t disappear as women get older. Reproductive hormones in women with PCOS differ from those in women without PCOS after menopause. Most importantly, inflammatory and metabolic parameters worsen with age, putting women with PCOS at increased risk of life-long health issues beyond menopause, especially the risk of developing CVD and type 2 diabetes. Nutrition management for older women with PCOS should take into account the risk of long-term complications associated with the disease. This supports the need for treatment involving dietary and lifestyle modifications and insulin sensitizers in older women with PCOS who have metabolic complications. Early detection and proactive treatment of PCOS are crucial to prevent the long-term metabolic consequences associated with this complex syndrome. Thus, dietitians play an important role in the management of PCOS. — Angela Grassi, MS, RDN, LDN, is founder of the PCOS Nutrition Center, where she provides evidence-based nutrition information and counseling to women with PCOS around the world, and the author of The Dietitian’s Guide to Polycystic Ovary Syndrome, The PCOS Workbook: Your Guide to Complete Physical and Emotional Health, and the section on PCOS in the Academy of Nutrition and Dietetics Nutrition Care Manual. She also was the 2013 recipient of the Award in Excellence in Practice in Women’s Health and a past recipient of the Award for Excellence in Graduate Research, both from the Academy of Nutrition and Dietetics. 1. Fenton A, Panay N. Management of polycystic ovary syndrome in postmenopausal women: a medical black hole. Climacteric. 2008;11(2):89-90. 2. Puurunen J, Piltonen T, Morin-Papunen L, et al. Unfavorable hormonal, metabolic, and inflammatory alterations persist after menopause in women with PCOS. J Clin Endocrinol Metab. 2011;96(6):1827-1834. 3. Tehrani FR, Solaymani-Dodaran M, Hedayati M, Azizi F. Is polycystic ovary syndrome an exception for reproductive aging? Hum Reprod. 2010;25(7):1775-1781. 4. Brown ZA, Louwers YV, Fong SL, et al. The phenotype of polycystic ovary syndrome ameliorates with aging. Fertil Steril. 2011;96(5):1259-1265. 5. Elting MW, Korsen TJ, Rekers-Mombarg LT, Schoemaker J. Women with polycystic ovary syndrome gain regular menstrual cycles when ageing. Hum Reprod. 2000;15(1):24-28. 6. Winters SJ, Talbott E, Guzick DS, Zborowski J, McHugh KP. Serum testosterone levels decrease in middle age in women with the polycystic ovary syndrome. Fertil Steril. 2000;73(4):724-729. 7. Schmidt J, Brännström M, Landin-Wilhelmsen K, Dahlgren E. Reproductive hormone levels and anthropometry in postmenopausal women with polycystic ovary syndrome (PCOS): a 21-year follow-up study of women diagnosed with PCOS around 50 years ago and their age-matched controls. J Clin Endocrinol Metab. 2011;96(7):2178-2185. 8. Macut D, Micic D, Parapid B, et al. Age and body mass related changes of cardiovascular risk factors in women with polycystic ovary syndrome. Vojnosanit Pregl. 2002;59(6):593-599. 9. Margolin E, Zhornitzki T, Kopernik G, Kogan S, Schattner A, Knobler H. Polycystic ovary syndrome in post-menopausal women--marker of the metabolic syndrome. Maturitas. 2005;50(4):331-336. 10. Ehrmann DA, Liljenquist DR, Kasza K, et al. Prevalence and predictors of the metabolic syndrome in women with polycystic ovary syndrome. J Clin Endocrinol Metab. 2006;91(1):48-53. 11. Krentz AJ, von Mühlen D, Barrett-Connor E. Searching for polycystic ovary syndrome in postmenopausal women: evidence of a dose-effect association with prevalent cardiovascular disease. Menopause. 2007;14(2):284-292. 12. Gambineri A, Patton L, Altieri P, et al. Polycystic ovary syndrome is a risk factor for type 2 diabetes: results from a long-term prospective study. Diabetes. 2012;61(9):2369-2374. 13. Moran LJ, Deeks AA, Gibson-Helm ME, Teede HJ. Psychological parameters in the reproductive phenotypes of polycystic ovary syndrome. Hum Reprod. 2012;27(7):2082-2088. 14. Boudreaux MY, Talbott EO, Kip KE, Brooks MM, Witchel SF. Risk of T2DM and impaired fasting glucose among PCOS subjects: results of an 8-year follow-up. Curr Diab Rep. 2006;6(1):77-83. 15. Salley KE, Wickham EP, Cheang KI, Essah PA, Karjane NW, Nestler JE. Glucose intolerance in polycystic ovary syndrome--a position statement of the Androgen Excess Society. J Clin Endocrinol Metab. 2007;92(12):4546-4556. 16. Talbott EO, Zborowski J, Rager J, Stragand JR. Is there an independent effect of polycystic ovary syndrome (PCOS) and menopause on the prevalence of subclinical atherosclerosis in middle aged women? Vasc Health Risk Manag. 2008;4(2):453-462. 17. Moran LJ, Pasquali R, Teede HJ, Hoeger KM, Norman RJ. Treatment of obesity in polycystic ovary syndrome: a position statement of the Androgen Excess and Polycystic Ovary Syndrome Society. Fertil Steril. 2009;92(6):1966-1982. 18. Marsh KA, Steinbeck KS, Atkinson FS, Petocz P, Brand-Miller JC. Effect of a low glycemic index compared with a conventional healthy diet on polycystic ovary syndrome. Am J Clin Nutr. 2010;92(1):83-92. 19. Sørensen LB, Søe M, Halkier KH, Stigsby B, Astrup A. Effects of increased dietary protein-to-carbohydrate ratios in women with polycystic ovary syndrome. Am J Clin Nutr. 2012;95(1):39-48. 20. Costantino D, Minozzi G, Minozzi E, Guaraldi C. Metabolic and hormonal effects of myo-inositol in women with polycystic ovary syndrome: a double-blind trial. Eur Rev Med Pharmacol Sci. 2009;13(2):105-110. 21. Papaleo E, Unfer V, Baillargeon JP, et al. Myo-inositol in patients with polycystic ovary syndrome: a novel method for ovulation induction. Gynecol Endocrinol. 2007;23(12):700-703. 22. Donà G, Sabbadin C, Fiore C, et al. Inositol administration reduces oxidative stress in erythrocytes of patients with polycystic ovary syndrome. Eur J Endocrinol. 2012;166(4):703-710. 23. Mooren FC, Krüger K, Völker K, Golf SW, Wadepuhl M, Kraus A. Oral magnesium supplementation reduces insulin resistance in non-diabetic subjects - a double-blind, placebo-controlled, randomized trial. Diabetes Obes Metab. 2011;13(3):281-284. 24. Oner G, Muderris II. Clinical, endocrine and metabolic effects of metformin vs N-acetyl-cysteine in women with polycystic ovary syndrome. Eur J Obstet Gynecol Reprod Biol. 2011;159(1):127-131. 25. Akilen R, Tsiami A, Devendra D, Robinson N. Cinnamon in glycaemic control: systematic review and meta analysis. Clin Nutr. 2012;31(5):609-615. 26. Masharani U, Gjerde C, Evans JL, Youngren JF, Goldfine ID. Effects of controlled-release alpha lipoic acid in lean, nondiabetic patients with polycystic ovary syndrome. J Diabetes Sci Technol. 2010;4(2):359-364. 27. Oner G, Muderris, II. Efficacy of omega-3 in the treatment of polycystic ovary syndrome. J Obstet Gynaecol. 2013;33(3):289-291. 28. Krentz AJ, Barrett-Connor E. Reduced serum ghrelin in a putative postmenopausal polycystic ovary syndrome phenotype. Fertil Steril. 2009;92(5):1753-1754. 29. Hirschberg AL, Naessén S, Stridsberg M, Byström B, Holtet J. Impaired cholecystokinin secretion and disturbed appetite regulation in women with polycystic ovary syndrome. Gynecol Endocrinol. 2004;19(2):79-87.